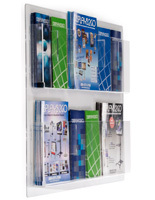 This wall magazine rack is an ideal brochure holder for an office or lobby. The clear acrylic pockets and black plastic backboard provide a neutral appearance to house literature. 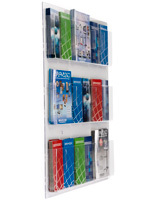 This pamphlet organizer, wall magazine rack features nine pockets that can hold standard 8.5" wide material. 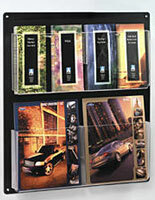 These pockets can also be adjusted to display (2) 4" wide brochures. This wall magazine rack includes dividers that snap into place within each pocket to make the conversion. 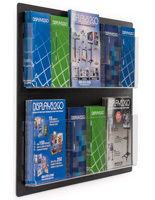 Choose to use one or up to nine separators to create a custom literature display. 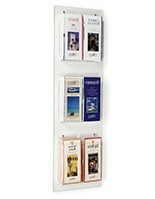 A wall magazine rack, such as this brochure dispenser is often hung in waiting rooms and reception areas to offer awaiting guests reading materials. The large size allows users to display a wide range of literature options. 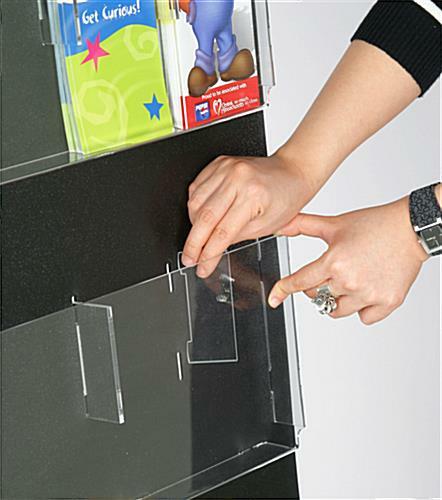 Each flyer display, wall magazine rack features clear acrylic front panels that allow for a complete view of the items on display. This brochure holder ships completely assembled; ready for mounting right out of the box. One person can easily hang this wall magazine rack in mere minutes. All of the necessary hardware is included with each purchase. This wall magazine rack features four holes, (one in each corner), to make mounting a snap. 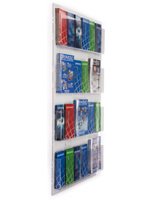 Buy this hanging literature display for an office or lobby today. 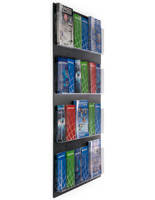 When in stock, this wall magazine rack ships fast! Was looking around for the right price-point for what you get. this deffinetly hit the mark. 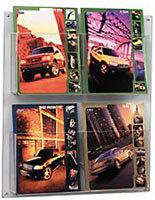 great amount of space for rack cards and brochures, with a great price point. Already have it hung up in the office proudly displaying all our information! The product came protected and was as expected from the box. Easy to install with just 4 screws and the dividers are simple to put in and take out. Looks very nice and fits our needs. That's wonderful, Matthew! Thanks for shopping with us. We love the racks. They are just size that we needed. Thanks. We're so glad you love your purchase, Paula! Thanks for shopping with us and taking the time to review. We liked our first Literature Rack so much we purchased a 2nd one! Thank you for the review Katy, and thank you for your repeat business!